How could I get a pastoral scene in New Zealand and not find lots of sheep? If you’ve ever been to the beautiful country of New Zealand, where sheep outnumber people 10 to 1, you may wonder why there aren’t any sheep in this idyllic scene. Well, they are there, but not in the center front. Those are boulders. 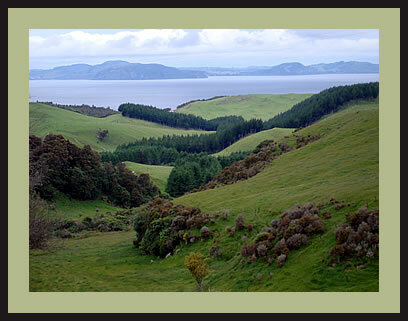 The sheep are far in the distance, too small to be seen in this picture that is hanging in my office.